If we work on a Grails project and we want to deploy our application as Web Application Archive (WAR) it is easy to create the file. To create a WAR file of our Grails application we simply invoke the command: $ grails war. Suppose we want to put our WAR file first on a system test application server, then a user acceptance test application server and finally the production server. We want this WAR file to be self contained and all code and configuration must be in the WAR file. We don't want to generate a WAR file for each environment separately, but a single WAR must be passed through the different environments. In this post we see how we can do this. Suppose we have a Grails application and we define a systemTest and userAcceptanceTest environment next to the default development, test and production environments. We add these new environments to the environments block in grails-app/conf/Config.groovy and set a simple property runningMode with a different value for each environment. Next we are going to change our grails-app/views/index.gsp and add a little code to show the value of the property runningMode. This way we can show which environment is used by the running WAR. Next we can deploy the WAR file to our application servers. But how can we set the environment for our application, so we can see the right value of our configuration property runningMode? 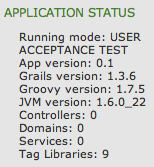 Answer: We need to set the system property grails.env with the correct value before we start the application server. 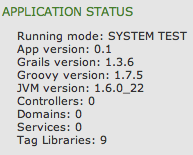 The Grails application determines in which environment the application is running by looking at the system property grails.env. And we see the different values for the different servers. So it is very easy to create a single WAR file, but with different configuration settings for different environments, because of the environments support in Grails. 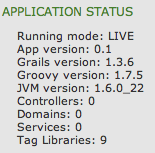 We only have to tell the application server via system property grails.env which environment settings need to be used. In the following post we learn how we can use configuration files outside of the application code. Per environment we can set a configuration property in separate files.